“Back to basics”. That’s what I’m naming this round of peanut butter reviews. I have reviewed a vast assortment of peanut butter from locally-produced small batch peanut butter like Eastwind Nut Butters to crazy flavored peanut butters from out-of-business companies like P.B. Loco, and everything in between. But it’s time for a review of some simple, basic peanut butter from different regions of the country. Also, check out my new 10-jar rating system! Each and every peanut butter reviewed on my site now has a score from 1 to 10 jars. Yellow jars are for standard peanut butter and Red jars are for flavored ones. The level of roasting is perfect, not too much, not too little. The grind is thick but silky smooth with just a pinch of salt. It’s a little bland and, in my opinion, needs more salt, but for organic peanut butter, this is a great value. This variety comes in a 2-pack of 28oz jars (56oz total) for around $7, which works out to $2 per standard size jar (16oz). The grind is very fine, which means the oil separates a lot but the texture is super creamy, so it’s the perfect choice for something like Peanut Sauce Stir-Fry. The only downside is that Kirkland is the private label of Costco, so you must go to Costco to buy it. My only question: Why is there no crunchy variety? Like your standard store-brand creamy peanut butter but a little better. Spreads more easily than Skippy but not as easily as Peter Pan. Simple and cheap, I use this style of peanut butter for cooking and baking so as not to waste the more expensive and tastier natural peanut butters. Good flavor and good enough for a PB&J. I still prefer Wegman’s brand a little better though, but not everyone has access to the fabulous grocery store that is Wegman’s. Similar in texture to a traditional Skippy-like peanut butter but tastes a little more like actual peanuts. The other difference is a bit more sugar which makes for a very tasty peanut butter. It’s very thick and creamy but spreads easily. 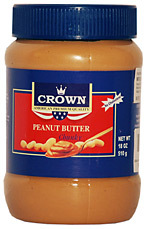 A cool fact about Crown is that apparently they used to sell their peanut butter in a drinking glass with a lid. After finishing the jar, you could keep the glass to use for drinking purposes. That got me thinking, I bet if you put a full jar of Crown peanut butter in the microwave for about a minute, you’d have a most delicious beverage! Crown is a southern US brand, which may explain the higher sugar content (those Southerners like their tea sweeeeet! ), but makes a great Pancake topping or classic PB&J. Just like the creamy, the crunchy variety has plenty of added peanut chunks. This variety tastes less sweet due to the added peanuts but actually has more sugar – go figure. It’s good, but the full experience of this peanut butter is better uncovered with the creamy variety. Great for some Peanut Butter Cereal though. And just look how classically old-school that jar is? How could you not? Can’t get enough? Check out all of my peanut butter reviews to discover the best and worst peanut butter out there! 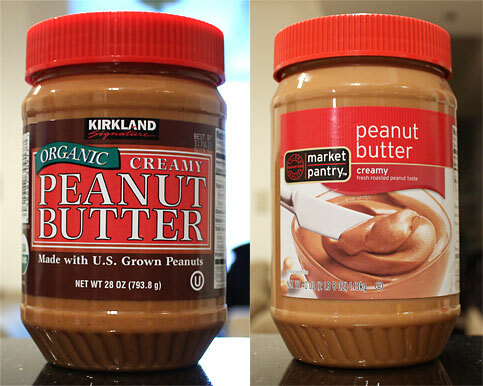 i love the kirkland brand peanut butter, it is a staple in my kitchen! It is great stuff indeed – you really can’t beat it! Hey I like your idea of doing more common PBs. Trader Joe’s is my staple, but I occaisionally try other types too and was thinking abotu Market Pantry (since I work at Target, which is where it’s sold). Do you have Meijer stores where you live? I recently tried thier brand of natural PB and… just review it sometime if you can. Trader Joe’s used to be my staple, I still use it sometimes, but 365 (Whole Foods) has since replaced it, as well as homemade peanut butter using “party” peanuts from the store. Try the Market Pantry, it’s not too bad and pretty cheap from what I remember. I don’t have any Meijer stores unfortunately, or I would definitely give theirs a try. I love that you reviewed the Kirkland kind. It’s my favorite! Definitely a solidly good peanut butter, hard to beat for price and quality. They really need to make a crunchy though! I am a Costco fanatic, but I actually prefer the Market Pantry… Just like you, I like a little bit more salt with my peanut butter. And you can get crunchy which makes a huge difference. You know, since writing this, I’ve actually changed my mind about Kirkland. I had it again recently and just wasn’t impressed with it anymore. It has NO taste. We compared it to Peanut Butter Boy brand at my office and eating Kirkland after eating PBB was like eating glue. So strange. The Market Pantry Natural peanut butter is good, definitely has a good touch of salt to it. Really? The Kirkland brand? I never even got to try it! Yes, the Kirkland brand. I had been buying it for years and years. At first I just thought it was out of stock, but they must have discontinued it. You need to start exporting your PBB brand of PB to the Middle East and namely to Qatar soon! We PB addicts need it! However I would suggest adding some sugar to the original recipe.. the ME surely has a high demand for quality PB but the stuff that sells are those that contain salt and sugar. Haha, I could export but I need to find an importer that’s interested! Plus, you might be the only customer Fathima! And like you said, everyone is used to sugar in their PB – I’m trying to change that! Besides, it’s much better without sugar, especially since I keep the peanut skins on.